What threshold offers weather protection? The only threshold that offers weather protection is the Standard threshold, with the OUTswing, configuration being more weather tight than the INswing option. Is your Aluminum System Thermally Broken? Yes! We now offer a Thermally Broken Aluminum System. Our Wood and Clad Systems are naturally Thermally Broken as well. How does a Lanai Door open? 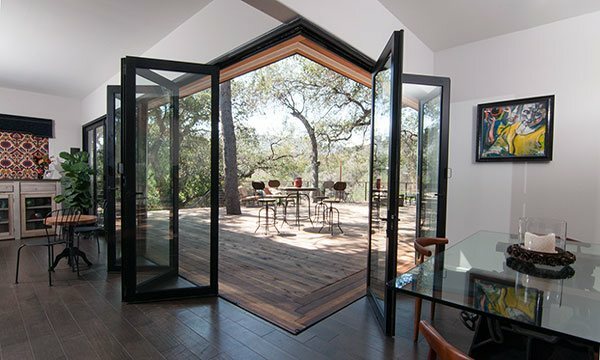 Lanai doors can have different configurations that offer different opening options. If you need an Active Swing door, then an odd numbered configuration must be created with a door handle on an odd sequenced panel. If you do not want an active swing door, then there are options to remove that handle. This will make the system like a wall from the outside when locked down. What is the maximum number of panels in one direction? 8 in one direction with a maximum on 16 total panels. We don’t have a standard size panel. Every job is built custom to your openings needs. We build our systems to your specifications. You can give us either a Rough Opening, or a Panel size. So instead we offer pricing brackets based off of panel sizes. 8-10 weeks typically, but it can vary. Please call us directly to verify. Can these doors support panic hardware? Yes, but please call to discuss limitations. What is your maximum size panel? Do you have a Quantity Discount? Yes it begins at 30 panels. Do these doors have a center pivot option? No. All the door panels will have to pivot from the end of the panel. Can these doors be built on a Radius? Yes. Please contact us to discuss limitations. Do these doors fold flat against the wall? No, they fold and stack at a 90 degree angle from the frame. For a period of one (1) year from the shipping date, Lanai Doors warrants to customer that Product delivered hereunder shall comply with selections and specifications included on the Job order agreement and/or change order and shall be free from defects in material and workmanship under normal use and service. If during the applicable warranty period, coastal is notified promptly in writing upon discovery of any defect in the product and Lanai Door's examination of such product discloses to Lanai Door's satisfaction the such product is defective and such defects are not caused by accident, abuse misuse, neglect, alteration, improper installation, repair, or use contrary to any instructions issued by Lanai Doors, Lanai Doors shall, at its sole option, either repair, replace or credit customer the purchase price of such product. Lanai Doors does not warranty any product removed from its original installation location or returned to Lanai Doors without Lanai Doors written authorization. The performance of this warranty does not extend the warranty period for any product beyond that period applicable to the products originally delivered. 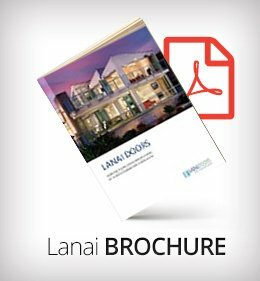 THE FORGOING WARRANTY CONSTITUTES LANAI DOOR EXCLUSIVE LIABILITY, AND THE EXCLUSIVE REMEDY OF CUSTOMER, FOR ANY WARRANTY OR OTHER NONCONFORMITY OF THE PRODUCT COVERED BY THESE TERMS AND CONDITIONS. THIS WARRANTY IS EXCLUSIVE, AND IN LIEU OF ALL OTHER WARRANTIES, LANAI DOORS MAKES NO OTHER WARRANTIES, EXPRESS, IMPLIED, OR STATURY, including WITHOUT LIMITATION ANY WARRANTIES OF MERCHANT ABILITY, FITNESS FOR A PARTICULAR PURPOSE, and OR NON-INFRIGEMENT. THE SOLE AND EXCLUSIVE REMEDY FOR ANY BREACH OF THIS WARRANTY SHALL BE AS EXPRESSLY PROVIDED IN THIS SECTION11, OF LANAI DOORS TERMS AND CONDITIONS. 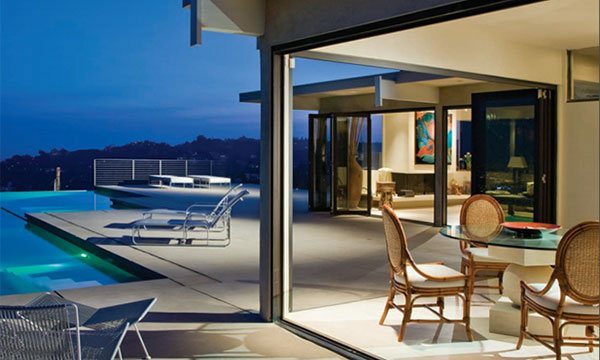 IN NO EVENT WILL LANAI DOORS BE LIABLE FOR ANY COSTS ASSOCIATED WITH THE REPLACEMENT OR REPAIR OF PRODUCT, INCLUDING LABOR, INSTALLATION, OR OTHER COSTS INCURRED BY CUSTOMER AND, IN PARTICULAR, ANY COSTS RELATING TO THE REMOVAL OR REPLACEMENT OF ANY PRODUCT.